This year's IPL has seen its share of controversies. Umpires have had a tough time so far in this tournament. There have been a number of wrong calls made by the umpires. The major highlighted incidents turned out to be the big no-ball call that was missed on the last ball of the RCB v MI game. We saw Kohli furious as the incidents were shown in the replays. 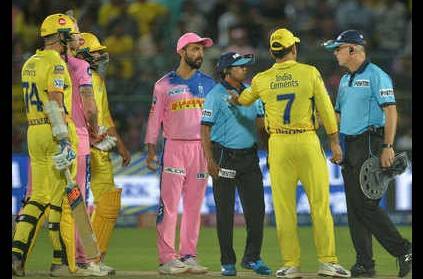 Another big incident was in the RR vs CSK match where the umpire first signaled a no-ball for above waist height and then backed out of the call. During this incident, we saw 'Captain Cool' MS Dhoni lose his cool and express extreme anger stepping into the ground from the dugout and arguing with the umpire. The Umpires were clearly wrong in their calls, but does that justify the player's reaction? Although the fans are taking the side of the players, neutral viewers and cricket pundits feel that these reactions do not go well with the spirit of the game and that these are bad examples that the players are setting for young fans that are following them. Dhoni had to face a penalty of 50 % of his match fee, but many feel this is not a kind of penalty that will change this situation. In today's time, players in the IPL earn enough that penalty of match fees is not going to make the difference. Experts feel that the penalties should create a bigger impact but that's missing at the moment. This page contains news relating to various facts and events. The views are generally about current affiars and general topics in diversified areas such as political, international, national, and regional issues, sports, health, travel, lifestyle, technology and business. People having similar interets on the above topics will find this page useful. Umpires having a tough tournament in IPL 2019 | Sports News.